I have always been very interested and curious about prefelts, especially because there are so many kinds out there and you always wonder which one will work best for your final project. 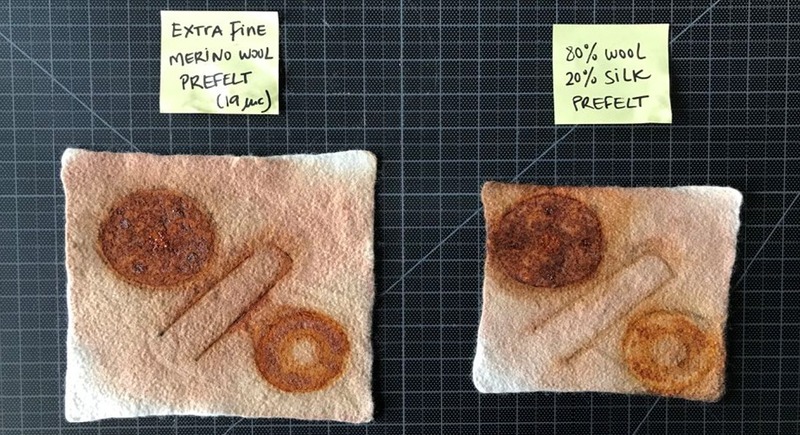 I love natural dyeing and staining my felt, and rust is one of my favorite techniques. 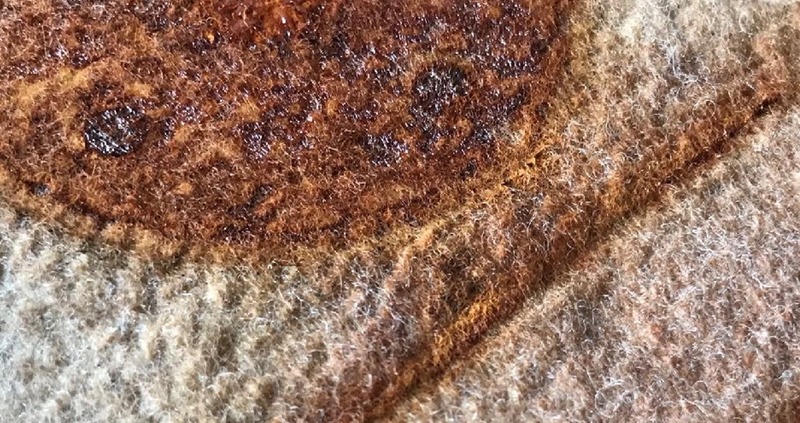 Wool likes rust, and it absorbs it like a sponge. And not only do I like to rust-dye, but I also love the final effect of stitching over the rust stain, and emphasizing some of the marks that rust leaves behind. For this project, I worked with two different kinds of prefelts from DHG. One is the extra fine merino wool prefelt, and the other is the 80% extra fine merino wool 20% mulberry silk prefelt. I always start with white, although it is not the only color you can work with. Any light color will take the rust stain, although working with white will result in a greater contrast. I have previously worked with the 80/20 prefelt before, but never with the extra fine merino. The first time I touched it I realized that the fibers are much more tightly bound than blended prefelt. It has a nice body and it feels slightly rougher. I cut one square of each prefelt, approximately 30cm x 30cm. As soon as I wet both pieces, I immediately noticed that the extra fine absorbed the water more rapidly than the 80/20 blend. And not only that, but I also noticed that the 80/20 blend lost a little of its initial shape. As I continued with the rolling of the 80/20, I saw that this continued happening, while the extra fine merino was able to maintain its initial shape until the very end of the felting merino absorbed the water more rapidly than the 80/20 blend. And not only that, but I also noticed that the 80/20 blend lost a little of its initial shape.merino absorbed the water more rapidly than the 80/20 blend. And not only that, but I also noticed that the 80/20 blend lost a little of its initial shape. As for the shrinkage, I believe the extra fine merino prefelt had less shrinkage than the 80/20 blend because the extra fine merino fibers are tighter. The extra fine merino had a shrinkage factor of 1.5 (approximately 35%), while the 80/20 blend had a significantly higher shrinkage: a shrinkage factor of 1.84 (approximately 47%). Both prefelts felt very nice after the felting process, although the 80/20 blend had a nicer drape due to the amount of silk in it. I could see right away that both had a great surface for rust-dyeing because of the near absence of fuzziness on the surface. This is important because the more hairy and fuzzy the surface is, the less noticeable the print will be. 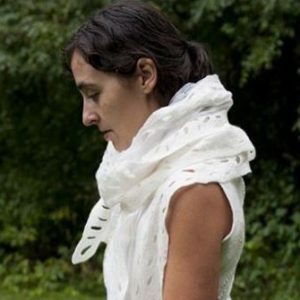 This is also a very important factor for me and my felted work because it will create less pilling overtime, especially if it is meant to be used as a garment. The time to create rust is when the felt is still damp. How does this work? Iron oxide, or rust, is formed when iron and oxygen react in the presence of water or moisture in the air. But before we start, let’s discuss studio safety first. When it comes to dyeing, with natural or synthetic dyes, always have your equipment designated for this purpose, and don’t use it for anything else. Even better, have a designated area in your studio for dyeing away from your fibers. 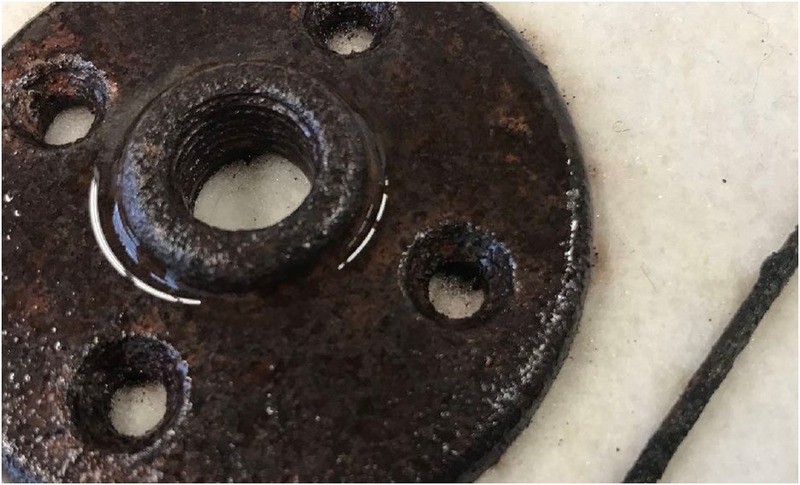 Please be aware that rust is very corrosive, and if the small particles of rust fall into your fibers, these will be contaminated with rust, and over time the fibers will be eaten up by rust! It’s also very important to work in a ventilated area, and it’s highly recommended to use a mask while doing rust-dyeing. Lay down plastic food wrap on your designated surface. If you don’t have this, you can also use old plastic bags big enough to protect your surface. Lay your pieces of felt over the protected surface. Fill your spray bottle halfway with water. Fill the other half with vinegar. Spray the felt with this water/vinegar solution to moisten it. Since the felt is already moist from the felting process, you don’t have to spray too much. Place the rusted objects on top of your felt and moisten them with the water/vinegar solution. Cover the objects and the felt with plastic food wrap and let it sit overnight. I like to wait for 24 hours to remove plastic food wrap on top. You will be able to see right away how much rust has migrated from the object onto your felt. I like to spray it one more time and let it sit for another 24 hours. After another 24 hours, you will see a lot more rust stained onto your felt. The rust stain was taken very nicely by both kinds of prefelts. I used objects with the same amount of rust, and I noticed that the extra fine merino prefelt took the color of the rust a little bit deeper than the 80/20 blend, but not by much. I wonder if the little amount of silk in the blended prefelt had an effect on this. What is curious to see is how much the rust migrated through all the felt and how it also made marks on the back of the felt. having a little bit more drape. Excellent post, Eva…Thanks so much for sharing. Just wondering if you use any technique to try to neutralize the rust after using this technique? I love your fabulous creations. Does the rust continue to be corrosive on the wool over time….how is it stabilised? Yes, rust continue to be corrosive on anything. I do like the idea of seeing overtime how the corrosion can modify the look and texture of the fiber, but I understand others won’t want that to happen on their pieces. Unfortunately we won’t be able to stop completely this corrosive effect, but a bath of light saline solution will slow down the process. This solution can be made with 1 gallon of water and 1 tablespoon of salt. I hope I was able to answer to your question!